Blue & white is just one of those classic color combinations. It’s like the more casual counterpart to the more sophisticated black & white. The color combination is often seen in stripe form, which gives it a nautical look as well. I wore blue and white twice this past week and both looks featured stripes. With the weather being rainy and unseasonably cool for the better part of last week, I needed to wear something that was flexible (weather-wise). 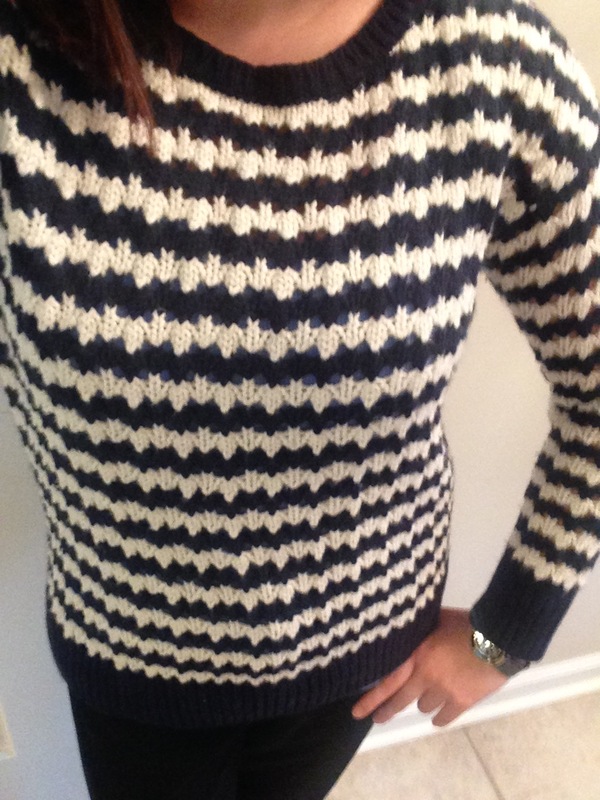 This sweater is light-weight and while providing some warmth (outside and if my building was chilly) it is also very light and breathable since it is open-stitch. I wore a sky-blue tank top underneath. The sky-blue tank top was a nice pop of color underneath and went nicely with the navy blue in the stripes. Originally, I had another top on and before leaving for work changed into this sweater because my original pick was bothering me. With the last minute switch, I needed something that didn’t need to be ironed! And so concludes my blue & white #1 for the week. The next day, I wore this blue & white loose cardigan that I have featured on here before. This past week was Spirit Week at school. Each day was something different such as twin day, wacky tacky Tuesday, etc. Friday was class color day in which each grade decided on a color or pattern to all wear. My 9th graders chose stripes and my 12th graders chose camouflage. I went with the stripes since I’m the 9th grade advisor, my 9th graders are less frustrating than my seniors at the moment, and stripes are just easier – I don’t own any camouflage! The cardigan is light-weight and I paired it with your standard ribbed tank top. The best part about this cardigan is the heart-shaped elbow patches! I’m not a huge elbow-patch fan, but when they are a fun shape like hearts, you just have to give in! I finished off the striped look with my striped Keds from DSW. And that concludes my blue & white look #2 from the week. My back to back blue & white looks weren’t intentional, or at least not at first, but there you have it. 2 takes on a casual, classic color combo.